Go to the homepage and view the Lectionary’s Liturgical Colors Corner for color ideas for today. 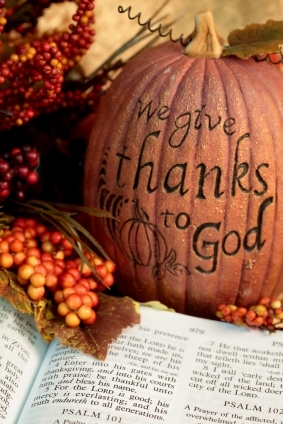 See today’s cultural resource unit for great Thanksgiving Day ideas. The job of each member of the Worship and Arts Ministry is to create an atmosphere of thankfulness for today’s service. (a) All Creatures, No 2. By Francis of Assisi. Tune by G. Kirchengesange. This selection is a modern take on the hymn All Creatures of Our God and King. (c)	Thank You. By Frank Ray, Jr.
(d)	Be With Us All, Lord. By Uzee Brown, Jr.
Thomas, Isaiah & Elements of Praise. The Greatest. Baltimore, MD: Habakkuk Music, 2008. Rosario, Joann. Joyous Salvation. New York, NY: Zomba Recording, 2007. Awesome. Washington, D.C.: Richscape Music, 2007. The Century Men. Offerings of Peace. New York, NY: Gotham Records, 2006. Franklin, Aretha. Amazing Grace: The Complete Recordings. New York, NY: Atlantic/Rhino Entertainment, 1999. Canton Spirituals. Driven. New York, NY: Zomba Recording, 2007. Hendricks, Barbara & Moses Hogan Singers. Spirituals, Volume 2. New York, NY: EMI, 2005. Peoples, LaTonya. Driven. Atlanta, GA: LaTonya Peoples, 2006. Yohe, Vicki. Reveal Your Glory–Live from the Cathedral. Newton, NJ: Shanachie Entertainment, 2009. Brown Clark, Maurette. The Dream. Atlanta, GA: Atlanta International Records, 2007. Leavell, Joe & The St. Stephen Temple Choir. God Is Able. Fleming Island, FL: Emtro Gospel, 2009. Williams, Malcolm & Great Faith. In Your Glory. Chicago, IL: Malcolm James Music, 2009. Trotter, Larry D. & The Sweet Holy Spirit Combined Choirs. I Still Believe. Indianapolis, IN: Tyscott Records, 2009. Munizzi, Martha. Change the World. Lakeland, FL: Say the Name, 2008. Winans, CeCe. Thy Kingdom Come. New York, NY: EMI Gospel/Pure Springs, 2008. New Community Life Choir. Nothing but Worship. New York, NY: Zomba Recording, 2007. David Crowder Band. Illuminate. Nashville, TN: Sparrow, 2003. Lang, Jonny. Turn Around. Santa Monica, CA: A & M Records, 2006. Clark-Sheard, Karen. All in One. Detroit, MI: Karew Records, 2010. Ford, Cedric & Heart of Worship. Created to Worship. Indianapolis, IN: Tyscott Records, 2009. Roberts, Greg & Soulful Celebration. Soulful Worship. Hampton, VA: Soulful Music Group, 2007. (c) Thank You. By Frank Ray, Jr. Peoples, Dottie. The Water I Give. Atlanta, GA: Atlanta International Records, 2003. I’ve Got a Testimony. Chicago, IL: Meek Records, 2009. My Destiny–I Know Why I’m Here. New York, NY: Integrity, 2006. Youth for Christ. Thanks in Advance. Jacksonville, FL: Emtro Gospel, 2010. Williams, Lance & True Worship. I Live to Love You. New Brunswick NJ: Lance Williams & True Worship, 2007. New Direction. Rain. New York, NY: Zomba Gospel, 2004. Radical for Christ. Praise in the House. New York, NY: Integrity Media, 1995. Edwards, Nadine. Intimate Moments. New York, NY: Nadine Edwards, 2009. Sapp, Marvin. Diary of a Psalmist. New York, NY: Zomba Recording, 2003. Souled Out. New York, NY: Zomba Gospel, 2008. Spontaneous Praise, Volume 1. Dover, DE: Impact Records, 2008. The Katinas. The Katinas: Collection. Nashville, TN: Gotee Records, 2006. Tankard, Ben. Mercy, Mercy, Mercy. New York, NY: Zomba Recording, 2009. Quiet Time Players. Sunday Morning Jams. New York, NY: Alliant Music Group, 2005. Times of Refreshing. New York, NY: Integrity Media, 2008. Pace, Joseph. Worship for the Kingdom. New York, NY: EMI Gospel/Alliant, 2007. (d) Be With Us All, Lord. By Uzee Brown, Jr.